The Jumper EZBook X1 is a great laptop but the Teclast F5 is an even better option with a lower price tag, a 128GB SSD, twice the RAM and support for active stylus. The 2-in-1 convertible form factor works wonders though. The webcam is located off centre and at the bottom of the screen. Convertible laptops are now mainstream and touch screen functionality is not only a welcomed but also a desirable feature on the specification checklist. Windows 8 kickstarted the trend but Windows 10 was the one that cemented multi-touch as something useful rather than a gimmick (like 3D). Gearbest sent us the sample and sells the Jumper EZBook X1 for $328 at the time of writing. Note that, while this price includes delivery, it is exclusive of any taxes that may be levied by HMRC or the courier companies on behalf of the vendor. Want to buy tech from online Chinese retailers? Read this first. Jumper is the latest Chinese manufacturer to try its hands at a format that was popularised by Lenovo and its almost legendary Yoga range. The EZBook X1 that was sent to us has a specific selling point; it is one of the very few convertible that have a sub 12-inch screen diagonal, a true successor to the once-might Netbook dynasty. It’s hard not to think of the 2014 Lenovo IdeaPad Yoga 2 11 when you look at the Jumper EZBook X1. Both have a 2-hinge design and an 11.6-inch touchscreen display. At 27.50 x 18.80 x 1.40 cm for a weight of just over 1Kg, it is more portable than an A4 writing notepad. In some aspects, the EZBook X1 is superior to the design that inspired it. It uses a full metal chassis with some plastic parts, making it feel far more premium than the Yoga 2 11. There’s a bevy of ports on the right of the device ( a USB type C connector, micro USB, micro HDMI), a microSD card slot with two side firing speakers and two microphones. The left side of the EZBook X1 contains the power button, an audio port and a volume rocker. Some might be disappointed by the lack of full size connectors but that’s a necessary evil should you want to connect other peripherals. You either need to bring an adaptor (preferably one that can delivery power to your device when connected) or carry cables. 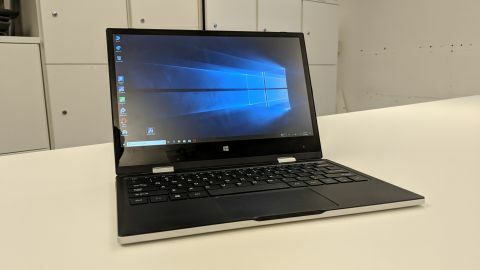 The screen is surrounded by 9mm-thick frames on three sides with a much thicker bezel at the bottom, one which houses the Windows home button and a webcam, similar to our editor’s choice, the Dell XPS 13. There’s a flap underneath the laptop that hides access to an M2.2280 slot occupied by a 64GB Foresee SSD drive. Other than the Intel Gemini Lake CPU used to power the Jumper X1, the other notable hardware feature of this laptop is the fact that it uses an odd pairing of eMMC storage (64GB) with a 64GB removable solid state drive. Even more surprising is that fact that the operating system lives on the slower eMMC storage rather than the faster SSD although that can be modified should you know how to do it. Note that the Jumper EZBook X1 comes with a tiny USB Type-C 24W (2A, 12V) power supply unit which can be used to charge some more recent smartphones. Alternatively, you will be able to use almost any Type-C connector/charger to charge (or trickle charge) the laptop. We tried with a Type-C cable plugged into a USB port from another laptop and it worked. The EZBook X1 is a thoroughly likable convertible laptop. The keyboard was surprisingly enjoyable, bearing in mind how small the item actually is. The keys are smaller than one would expect but they provide with good return even if the key travel is a little too shallow for our liking. The only other issue we encountered was the size of the Enter key: we’d prefer a smaller right hand side Shift key instead. Given its price we were not expecting miracles from the screen, an 11.6-inch FHD IPS model. It is covered with a non-oleophobic glass panel which adds to the glare, impacting the display contrast, and makes it difficult to use in bright sunshine, especially since as it is a fingerprint magnet and even with the brightness slide pushed to maximum. The EZBook X1 lasted a disappointing 2hr50m when playing a count up Youtube video using Windows’ best performance setting, maximum brightness and - most importantly - preventing the system from shutting down, dimming or switching off the display. Somehow, Jumper managed to cram a 26.6Whr battery in a very tight space. There aren’t many convertible laptops offering this set of features in this price range. The Lenovo IdeaPad 110S has an altogether worse hardware set with the only standing out point being a 1-year subscription to Microsoft Office 365. If you can put up with Google’s Chrome OS, then the Inspiron Chromebook 11 2-in-1 convertible laptop from Dell, is an attractive alternative at $299.99, even more so given that it is a rugged device that can withstand some serious abuse and comes with proper full size ports. HP, amongst the main computer brands, is the one that offers the more compelling models with the $389 HP Chromebook 11 G6 EE being our preference as long as the OS is not an issue. While it sports a slower Celeron CPU, it comes with twice the RAM (8GB) and a full array of ports plus 100GB of Google Drive storage for two years. The best alternative to the Jumper EZBook X1 though remains the Teclast F5. It is significantly cheaper at $300 and comes with a single 128GB SSD which removes the issue of having two separate storage components. It also has twice the amount of memory (8GB) and there’s even a stylus for it. Outside of the usual caveats associated with purchasing products from Mainland China (and usual support conundrums), there remains the fact that the Teclast F5 is a better alternative altogether thanks to extra memory, support for active stylus, a unified storage structure and a cheaper price tag. There’s not much going for the EZBook X1 (which intrinsically is not a bad product) given that both share the same hardware specification sheet. The form factor is attractive to those looking for a (much) cheaper alternative to the Microsoft Surface Go tablet with keyboard cover.